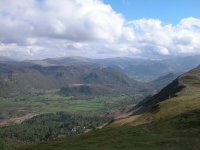 On the second day of the Bank Holiday weekend I was planning to take the bus down to Seatoller and make a return visit to Rosthwaite Fell to "bag" five unclimbed tops. The weather, though, had other plans. 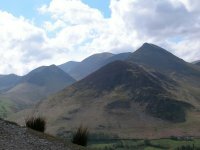 The clouds rolled in during breakfast, thunder echoed over the fells and Keswick was hit by a vicious cloudburst. Had it not been a Sunday the buses would have been running hourly and I'd have been on the 10.15 to Penrith and heading home. It was fortuitous that I was delayed. There were two more heavy falls during the morning but after midday it started to clear up, and fast. What could I do in the afternoon? Again, the relative paucity of public transport on Sundays closed down the options. I was going to have to choose a single peak and venture up and back. I wandered down to the boat landings. 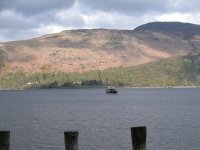 And there was Catbells, beckoning across the lake. 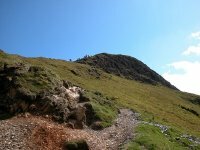 I'd climbed it three times before and had never yet enjoyed the luxury of sunshine on its summit. This afternoon was going to be different. I went to the Lakeside Cafe for lunch once the storm passed over. 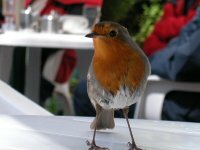 An inquisitive robin joined me at my table and posed for a photo. Derwentwater after the storm. You can say this for storms - they leave the air particularly fresh. 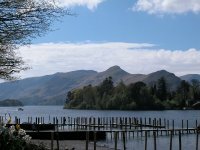 Catbells beckons across the lake. 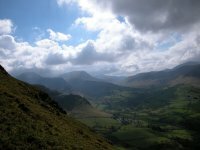 Another shot of Catbells with less foreground clutter. 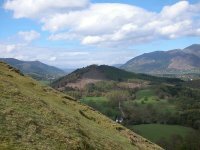 Grizedale Pike from the same spot. 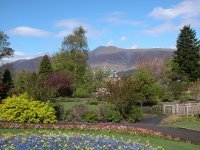 With twenty minutes to wait for the next boat I strolled into nearby Hope Park and grabbed this image of Skiddaw Low Man. 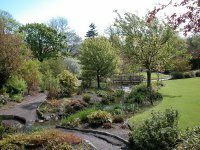 A scene in Hope Park. 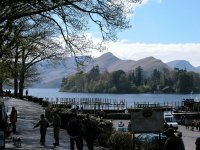 A final view of Hope Park before the boat left for the western shore of Derwentwater. It seems that everyone else had the same idea as me. The boat was full and I had to wait for the next one at 2.30. 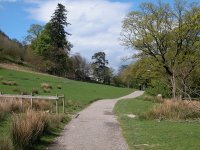 To add to the problems the landing at Hawse End was closed and I had to go to Old Brandlehow, half a mile to the south. The time was going to be tight, I'd lost forty minutes. 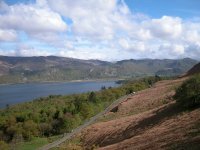 I walked briskly along the lakesore path after we landed, though the scenery was inviting enough for me to stop for this picture. 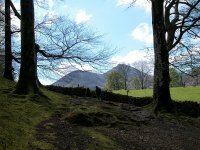 Catbells, seem close up through a gap in the trees. 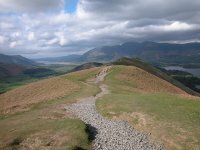 The path veering inland away and heading for the northern end of Catbells. The initial plod up through a small wood at Hawse End, and a beautiful view of Causey Pike (always recognisable by its knobbly summit ridge). 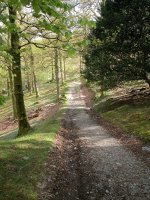 The path came out onto the west Derwentwater road and from there the climb began. 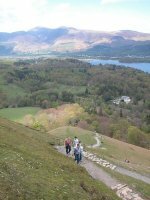 Catbells is the most popular fell in the Lakes and the path is beautifully maintained, but it is dauntingly steep and I wonder how many aspiring fellwalkers make it their first and last ascent. One consequence of the steep gradient is that the views open out quickly. 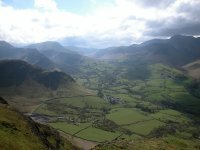 Here I'm looking to the north, with Skiddaw dominating the view. 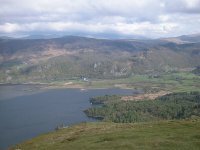 The "private" fell of Swinside, the one Lakeland hill to which access is denied. 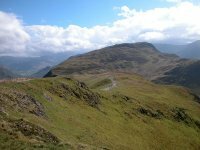 It remains to be seen whether the forthcoming "right to roam" review of land use will open it up to walkers. 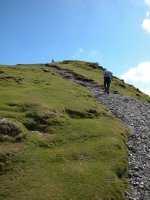 The path gained height rapidly. 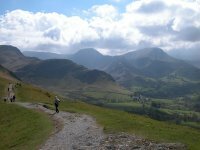 Lakeland in all its glory - the view across the Newlands valley to the west, with Causey Pike and Grizedale Pike towering above the pastures. 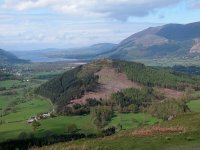 Another view of Swinside, but now we're high enough to see Bassenthwaite beyond. 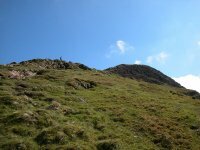 Dodd and Long Side rise to the right. 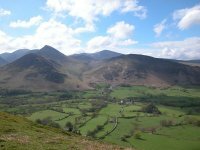 Causey Pike seen end-on, with Scar Crags, Sail, Eel Crag and Grasmoor crowding behind. 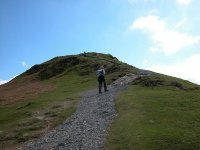 The steep ascent to the north top of Catbells. Hopefully these images give some idea of the relentless gradient. 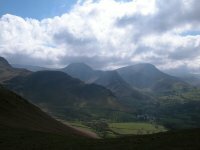 The Newlands valley to the southwest, with Robinson and Knott Rigg standing either side of Newlands hause. 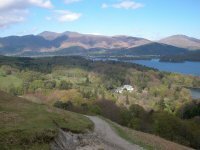 Derwentwater to the southeast from the same spot, with the wooded Grange Fell prominent in the view. 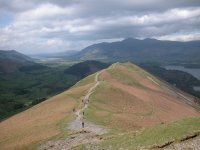 The north top of Catbells is reached and from here it's a swift and easy stroll along the ridge to the main summit. 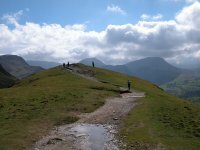 A wide-angle view along the ridge of Catbells. 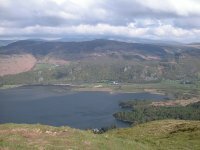 The view from the same spot a few degrees to the right, showing Dale Head, Hindscarth and Robinson. 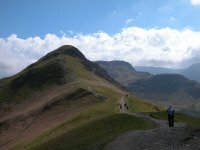 The summit dome of Catbells draws nearer. I'm almost at the end of the easy section. 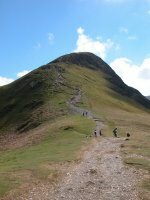 There's another stiff gradient ahead, and beyond that is an awkward craggy bit. My gaze was continually drawn across Newland to the right. 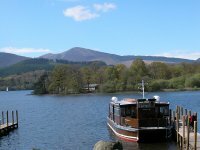 The Lakes can rarely have looked lovelier. Down to business. 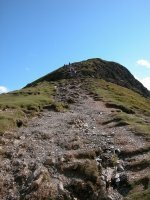 The final climb of Catbells begins. I reckon it's going to take fifteen minutes. 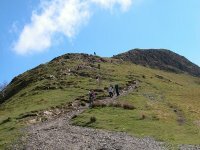 Three minutes later and the ribbon of walkers making their way to the summit can clearly be seen. Looking back along the ridge to the north top as I pause for breath. 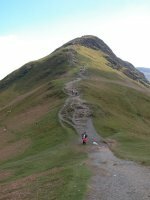 It's hard work climbing Catbells, but exhilarating in these conditions. 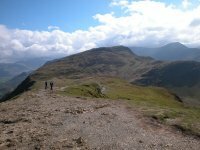 Again the steep gradient rewards the walker with quickly expanding views. 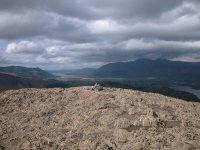 The north ridge with Bassenthwaite beyond. It's steeper than it looks. It's a real effort here and it's about to get harder. ....I launch myself at the barrier of splintered rocks that defends the topknott. 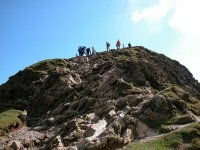 You can't walk up this, it's too steep and too rough. 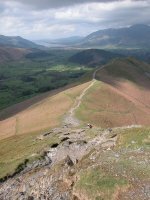 In fact Catbells is impossible to climb without resorting to six-point contact (basically, using your feet, hands and buttocks) to lever and claw your way up over the rockstep. Once you're over that obstacle, however, you're on the summit in another couple of minutes. Here's the view to Maiden Moor, further along the ridge to the south. 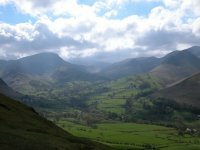 And here's another image of that sublimely beautiful view down the Newlands valley to the southwest. 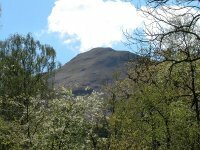 A closeup of Maiden Moor. 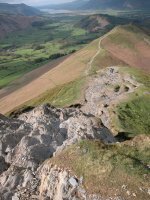 A closeup of Knott End, Maiden Moor's northwestewrn spur. 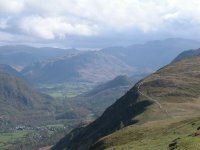 A closeup of the Jaws of Borrowdale to the southeast. 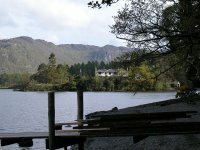 Grange and the Lodore Falls Hotel at the south end of Derwentwater. 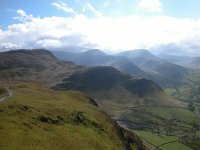 A wider shot of the same area, looking at the High Tove ridge and across to Helvellyn beyond. 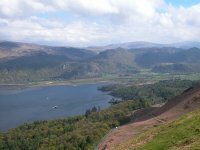 A closeup of Grange Fell, one of Lakeland's most charming lesser hills. It was my second choice for the afternoon's walk. 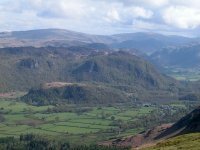 Looking through the Jaws of Borrowdale to Rosthwaite, with Rosthwaite Fell and Glaramara (my original destination of the day) beyond. Catbell's summit dome, a confusion of sharp slate and quite uncomfortable to sit on. Standing was not an option, however, for the wind was blowing at gale force up here. A view of the rockstep from above, which I hope serves to illustrate just how tricky this path is. It's just as awkward and undignified going down. 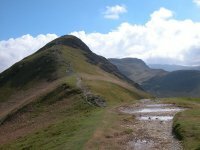 Back at the col, and I've taken the decision to save some time by using the path down the flanks of the fell to the right. 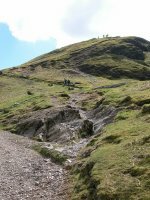 I quickly wished I hadn't done so, for this path is equally as steep as the ridge path but has absolutely no cohesion - it's composed of tiny, friable grains of gravel with nothing for your boots to get a grip on. Once more I was reduced to sliding along on my bum, or risk a far greater rate of uncontrolled descent. 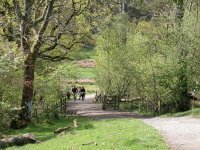 Fortunately it dodn't take long, and I was down to Manesty Woods with half an hour to spare before the last passenger launch back to Keswick. ...and watched as the boat approached from Lodore. I was back in Keswick at 6pm at the end of a short but satisfying expedition. 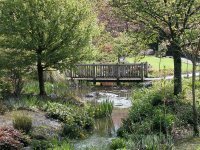 Available on CD - the high resolution (2560 x 1920 pixel) originals of the images on this gallery. 72 images, 101MB of data. (includes some images not selected for the website).